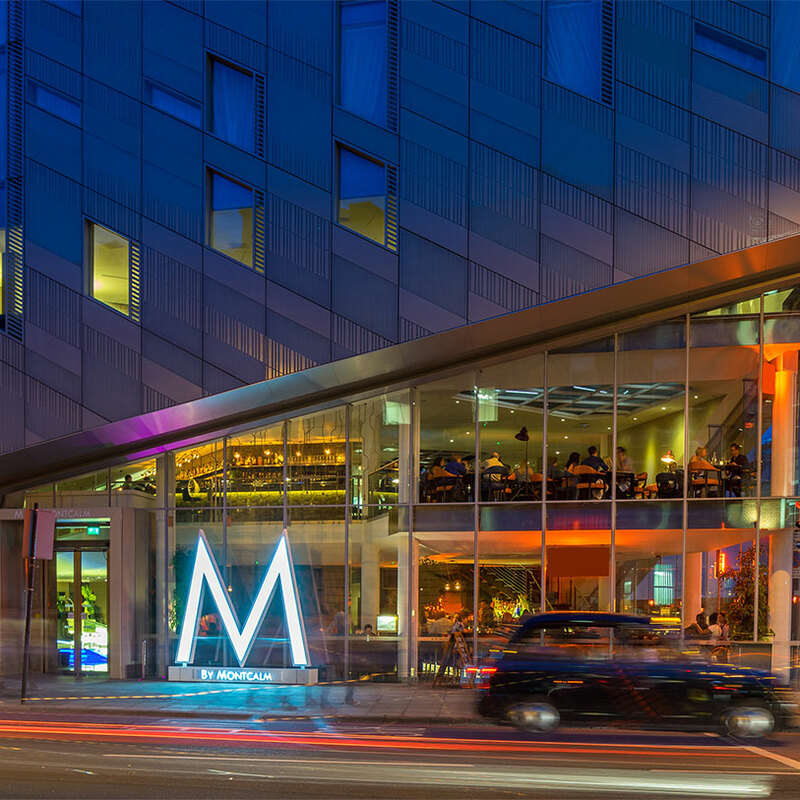 Energizing, beautifully designed and brimming with unexpected detail, M by Montcalm is our spirited younger sibling - a nucleus for London’s most progressive neighbourhood. In an architectural first, the building’s distinctive diagonal shapes are inspired by the work of Tate Modern artist Bridget Riley, bringing an original style even to the streets of Shoreditch. Rooms are sleek without being showy, there’s a spacious spa and pool, and Plate is an acclaimed restaurant with mezzanine bar perfect for people-watching. Contemporary, calming and cool, these stylishly decorated rooms offer the ultimate in tech-enhanced comfort, with UK king size beds, sleek marble bathrooms with powerful Grohe rain showers. There is also an aroma box, which adds to the room's calming ambience and is part of M's unique offering. Our pillow menu gives you a choice to get an excellent custom-made sleep and start your new day feeling your best. Smart, stylish and thoughtfully designed, the Club Double is bathed in natural light and features plush fabrics, evocative lighting and a selection of sensuous room aromas. Club Room guests also enjoy Club Breakfast. Perfect for colleagues or friends traveling together, the Club Twin is every bit as stylish and luxurious as the double with the same generous amenities, but features comfortable twin beds. A little larger than its fellow Club Rooms, the M Club Double is a luxurious, light-filled space with the same plush fabrics, evocative lighting and sensuous room aromas. Club Breakfast completes the package. Triple rooms are specially designed for travelling companions, whether families, friends or colleagues. Space, light and comfort make the company of others a pleasure, with tactile fabrics, state of the art technology, 37" HD LCD TV, and a well-proportioned work space. Marbled bathrooms benefit from separate bath tub and powerful Grohe rain shower, with toiletries by Elemis. A study in sophistication, the M Junior Suite is a stylish, serene space bathed in natural light. Each one individually designed, with tactile fabrics and state of the art technology, the bedrooms feature a UK king-sized bed, a well-proportioned work space, 37" HD LCD TV . Marbled bathrooms benefit from powerful Grohe rain shower, with toiletries by Hermes. Light-filled and spacious, with stylish touches everywhere, the M Family Suite features a UK king-sized bed and connecting room with comfortable sofa bed. In the area there's a well-proportioned work space, 37" HD LCD TV, snug but stylish wool mix armchairs and a glass topped coffee table. In the marbled bathroom there's a separate bath tub and Grohe rain shower, with toiletries by Herme's. High above the City, the Sky Club Double is a study in contemporary style. Icons of the London skyline dot the horizon as you take in the views, while sleek, high-spec furnishings and advanced technology invite undisturbed relaxation. Spacious marble bathrooms come with Hermès amenities, and breakfast is served with our compliments in the Club Lounge or Plate restaurant, exclusively for Club room guests. Sky Club Double guests can also bypass reception with seamless in-room check-in. Lap Top availability in Room on Request. With plenty of space for travelling companions and all the comforts of the Sky Club Double, these high category rooms have twin beds against a dramatic backdrop of the London skyline. Bathrooms are sleek, spacious and stocked with Hermès amenities, and in-room laptops are available on request. Complimentary access to the Club Lounge is included, as is breakfast served either here or in Plate restaurant. The last word in sky-high luxury, the sought-after Sky Club Junior Suite is among London's most memorable. Dramatic views stretch in every direction, momentarily distracting you from the delights within. They include luxe furnishings, the latest in advanced guest technology, and a comfortable seating area for stretching out in style. Replete with Hermès amenities, the bathroom is sleek and spacious, with powerful rain shower and separate bathtub. Complimentary breakfast is served in the Club Lounge or Plate restaurant, and in-room check-in makes for a seamless start to your stay. A memorable base for a family trip to London, the spacious Sky Club Family Room is configured for comfort and convenience, with amenities (and views) to impress guests of every age. Advanced tech keeps everyone entertained, and there's complimentary access to the Club Lounge where breakfast is served. In the bathroom, Hermès products are perfect for a little well-earned pampering after a day about town with the kids. - Lap Top availability in Room on Request. - Access to club Lounge.